Click on the headings to learn more about OVF through these short videos. OVF Phase I Lower member Anthony Lai shows you how to make pesto from OVF grown basil. Ocean View Farms on KCET's City Walk (first aired: October 23, 2014) featuring Garden Master Ed Mosman and then Phase Four Lower Phase Representative Christi Wilhelmi. Executive Producer: Steven Reich. 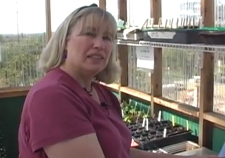 OVF Greenhouse Keeper Nina Rumely teaches you how to plant leeks. OVF Greenhouse Keeper Nina Rumely takes you through the steps of succesful seed starting. The OVF Shredding Crew in action. OVF President Frank Harris introduces the OVF Composting Program. The space shuttle Endeavor flies over OVF on its' way to LAX on Friday, September 21, 2012. Our March 2011 winning entry into the DeLoach Vineyards Community Garden Campaign in partnership with Organic Gardening Magazine. OVF was used as one of the locations in this 2016 McDonald's commercial. Keep alert! We're only there for a second or two, once near the 27 second mark and again around the 54 second mark. OVF was used as one of the locations in this 2016 Subaru commercial, shot for the Japanese market. Once again, we're only there for a short bit, near the 30 second mark.